By now, most IT staff has either had a chance to deploy OpenStack, or at least are familiar with what it is and what benefits it offers. We’ve moved past the installer race, the fragmentation of “as-a-service” components, and endless TCO calculators. The ecosystem and community has reached a maturity stage where the media and industry alike are calling OpenStack “boring“. Don’t be fooled, all of these are good things. They’re a product of fast-paced innovation seeing a settling of opinions and decision making. OpenStack has reached a maturity point that Linux also hit earlier on in its journey. As linux was (and still is) an incredibly capable and cost-effective option for an OS, OpenStack is also an incredibly capable and cost-effective option for private or public cloud. But now what? What’s next? The answer is deeper and more efficient capability, addressing more edge use-cases, and general polish and integration of all the development that’s happened to date. The low-hanging-fruit development is over, we’re deeper into the less exciting and less headline grabbing work; maximizing the assets as much as we can. Getting the most out of your instances. This is a great summary on the options available to maximize function and performance of OpenStack instances. Helpful deployment and operations management tips. These are great suggestions on working smartly with new deployments, and maintaining them throughout the lifecycle. 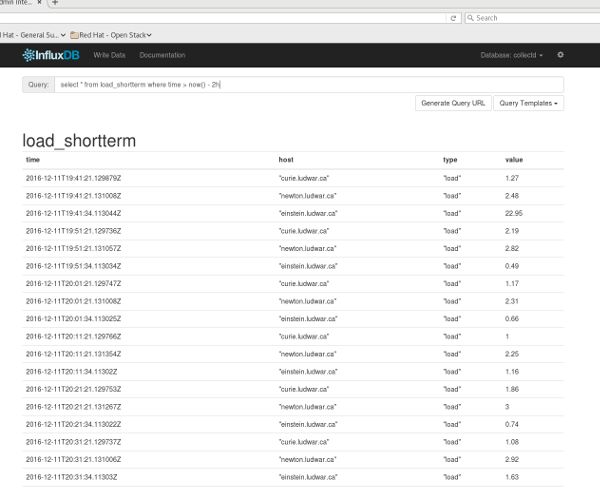 Operations must-have: dynamic ansible inventory for TripleO. If you’re doing ad-hoc maintenance on your cloud outside of tripleo, you’d be silly to not use ansible and its dynamic inventory. 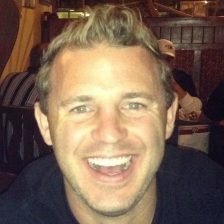 What OSP technologies should I look at to help scale and tune for network intensive workloads? Now that we know what technologies are available, if I have “x” workload, which options should I tune? If you have any questions, or come across anything else that you think should be added – let me know! Happy management and tuning. I’m a little late on this post, but last week we had an excellent presentation on OpenStack installers. Specifically, TripleO. 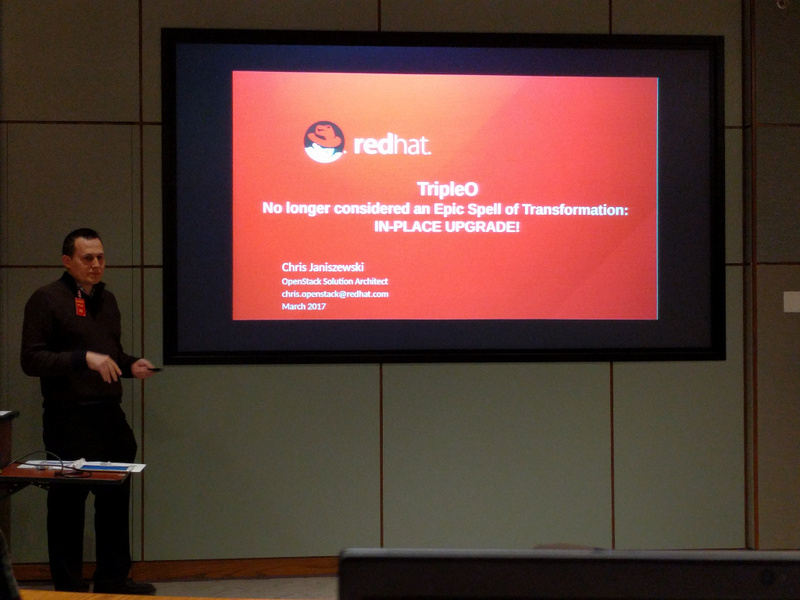 Chris J from Red Hat gave us a good outline of TripleO’s capabilities, and kept it pretty upstream. For the presentation slide deck, see here. The group tries to keep it as vendor neutral as possible which is nice. There were a lot of questions and feedback, this is probably a topic worth going into in a little more detail, or perhaps doing some hackfest demo’ing! There’s been quite an uptick in our local OpenStack meetup group lately, it’s been fun to see and get involved with. Both this group, as well as our Red Hat User Group has brought in some high profile and very talented open source folks who’ve presented and shared their knowledge with us. The OpenStack meetup groups across Canada have come together and created a Slack channel for easier communication and sharing among its members. If you’re interested in joining the channel, drop a comment or send me an email for an invite! I’ve seen some pretty interesting Grafana graphs floating around the interwebs recently and finally made some time to investigate all the hype. I found a great blog post on how this technology is laid out; that blog post should be all you need to get started. I started by creating a new VM to host both my InfluxDB database, and the Grafana dashboarding service. Then I installed and enabled collectd on all the systems I wanted to collect data on. I enabled some of the basic plugins like smartd, libvirt, etc. and was up and collecting data quite easily. Collectd does a great job of basic data collection services, most of the data you’d typically want is gathered without any extra configuration or fuss. The plugins available seem vast. InfluxDB on the other hand took me a little time to understand how a time series database is intended to work. Very nice! The interface and graph creating is very intuitive, I won’t bother explaining it. But I will talk about the last three graphs, as I ended up parsing this data into InfluxDB manually myself. Grafana has a few pre-defined data sources that you can use, however they’re mostly other time-series databases or data aggregation frameworks. What happens if you’ve got other simpler metrics sources like scripts, or logs that you want made into pretty graphs? Keep reading, 🙂 . I use speedtest-cli to do basic monitoring of my ISP internet connection. This is the command-line equivalent of using the speedtest.net browser speedtest. It makes some concessions in its accuracy/speed, however it’s still quite good at providing a basic up/down and latency test. Using this in conjunction with smokeping gives me a good health assessment of what my internet service provider is actually giving me. I’ve got several months of this speedtest data in logfiles that I want grokked into Grafana, but how do I do that considering Grafana’s data sources? This script calls the speedtest-cli shell command, performs the test, captures the data, then inserts it into InfluxDB under a new measurement called isp_bandwidth. I’m then able to query as usual from InfluxDB. This script reads a logfile of previously captured speedtest-cli data, and inserts it into InfluxDB. On my github page you can find a formatted logfile for an example. If you’ve got similar data, it should be easy to use awk to format it to be used for this script. During this process I noticed there had been a new speedtest utility released that does shortform results reporting. I switched to using this new form in the process, as this form also displays latency in addition to up/down bandwidth. So my previous log data won’t have the latency captured. 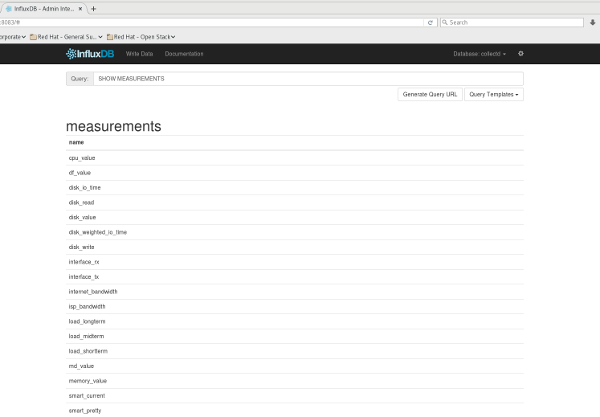 Note, InfluxDB has good documentation on how to write data into it, should you need to. One should also note that the preferred data types to use in InfluxDB are either integer or float. It isn’t easy to convert already captured data into another data type, (I had originally and unknowningly imported all my log data in string format, which throws off the min/max/avg statistics among other things), so it’s important to do it correctly the first time around. All in all, I’m pretty happy with the Grafana/InfluxDB/collectd experience. Once again, open source software is enabling users to have access to highly innovative and cost-effective solutions that drive value for their business.